None of my family like Christmas cake as it’s too rich and heavy, but we adore the taste of marzipan, which is why I invented this cake. Okay, it’s Christmas Eve and you’ve already bought or made your cakes and puddings, but this recipe will do just as well as a celebration cake for New Year, or as a pudding with custard and/or ice cream. So get baking next weekend and surprise everyone with this super-gooey and tasty offering. Prepare 18-20 cm round tin, lined with baking parchment, or greased and lined with greaseproof paper. Put the sunflower spread and caster sugar into a bowl. Mix with an electric whisk or beat with a wooden spoon until light and fluffy. Whisk the eggs in a separate bowl and add them a little at a time into the butter and sugar. Fold in the sieved flour and baking powder with a tablespoon. Best to fold in a third of the flour at a time. The mixture should end up of a soft dropping consistency. If it is too dry, add a dessertspoon of milk. Stir in the halved cherries and cubed marzipan. Spoon the mixture into the lined cake tin and smooth it out with the back of the spoon. 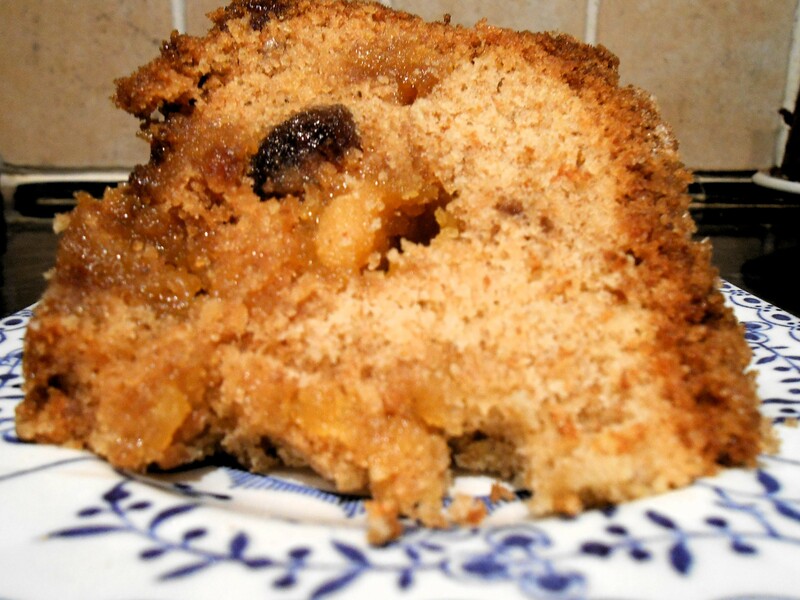 Sprinkle a generous amount of demerara sugar on the top of the cake. Place the cake in the centre of the oven and bake for 2-2½ hours, but check after 2 hours, as this is usually long enough as you don’t want your cake to dry out. Leave in the tin to cool before removing. Oh lovely. I too think the puddings and cakes of Christmas are a bit weighty for me – this looks scrummy. It is. We just ate a large slice each, to cure our rumbling tums. Our turkey won’t be ready until 4 pm. Looks delicious. Merry Christmas Sarah! Yes, it’s very easy to make. I have a recipe for an all in one sponge cake too, but that’s not my invention. The most laborious bit is lining the cake tin. I always get cross doing that bit! Thanks, James, for the mention. 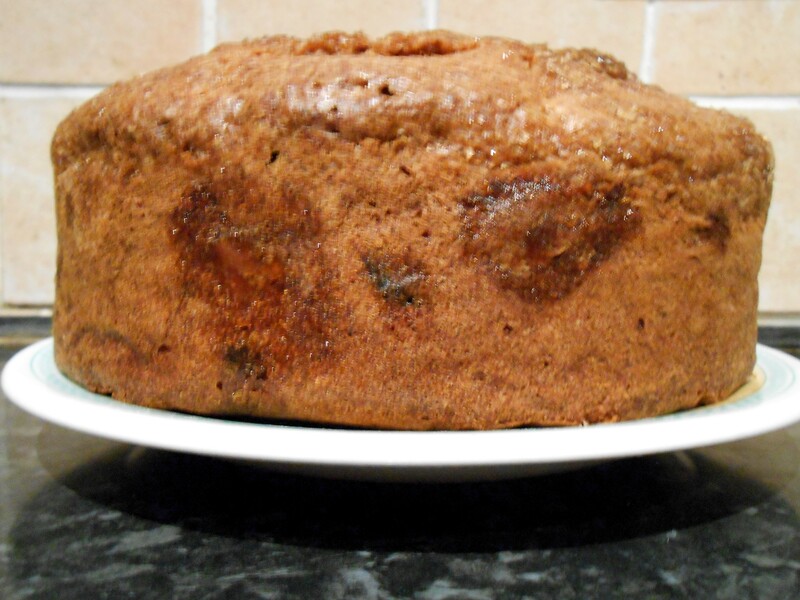 For those of you who didn’t know me back in December 2013, here’s my “Marzipan and Cherry cake” recipe, which my family love so much that I’m expected to back one every Christmas/New Year. Sometimes, if they’re extra lucky, I produce one for Easter, too!